There is nothing more. Just PRINCESSES! 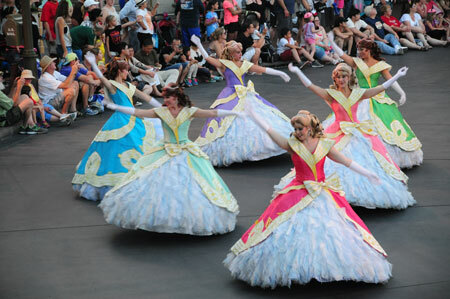 Because, chances are, if you are a five year old girl, besides the Fairies, Disney is all about Princesses. On our first full day at the park, we saw all of them from a distance at Mickey’s Soundtastic Parade (well worth it, as I mentioned yesterday.) But seeing Princesses high up on a parade float wasn’t enough. 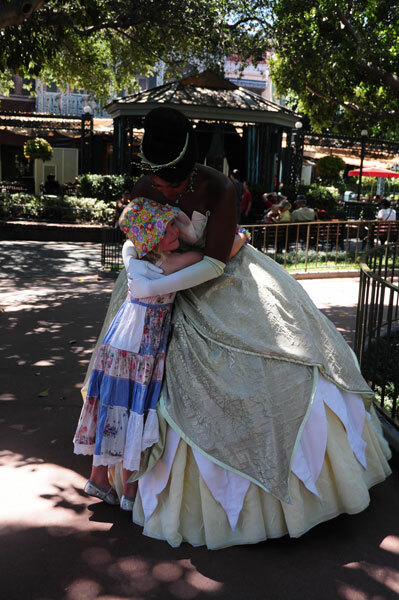 Especially after we’d met and hugged Tinkerbelle and Fairy Iridessa in person. 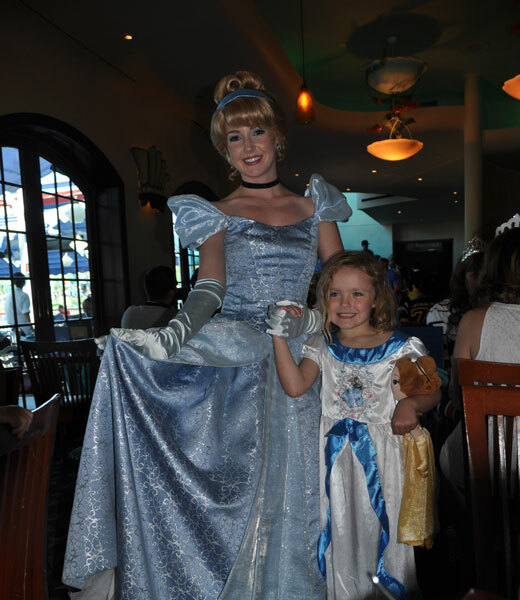 So today was built all around a special treat — lunch at Ariel’s Grotto, where word has it, Princesses hang out. Actually, it was a pretty sure bet we’d meet Princesses, mainly because I wasn’t leaving this important element to chance. 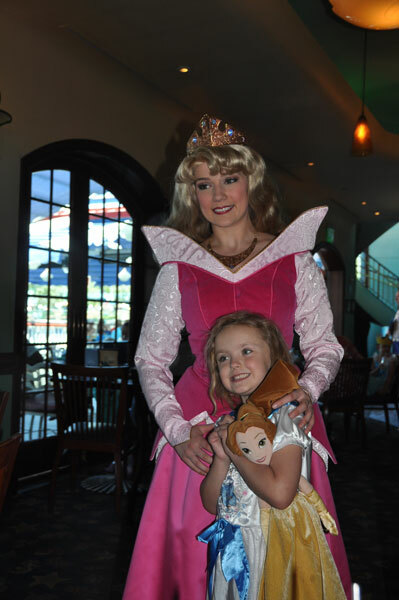 I’d heard about “character dining” where key Disney peeps visit you during a sit-down lunch or breakfast. To get the details, I made so many phone calls to the Disney travel agency that certain “Cast Members” were saying, “Hello again, Lisa” just at the sound of my voice. There may be some sort of tiered, price graduated level of Princess Dining. I don’t know. Before they could explain the options, I countered with: “Just tell me how to guarantee face-time for my goddaughter with every single Princess who walks in that room.” Whatever level that is, we got it. And it was worth every penny. Here’s the drill: while everyone else waits in a long hot line to maybe get a glimpse of a Princess on her way to the rest room, we had a designated reserved seating. 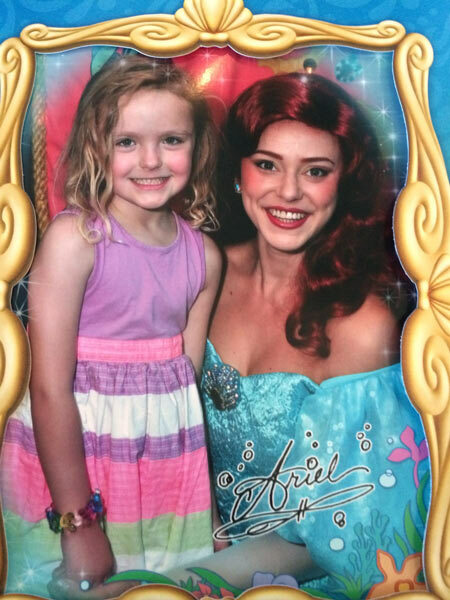 We sat in a cool lobby alcove at Ariel’s Grotto until our personal valet escorted us down to have our picture taken with Ariel, who, for this occasion was in human, not mermaid form. 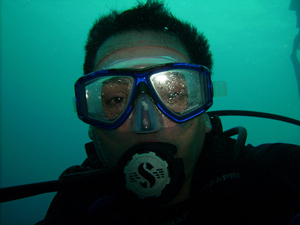 We were escorted to an undersea themed dining room that was surprisingly small — with maybe fifty tables. Without further ado, a page came out and announced our first Princess, Cinderella. She began making her way slowly around the room, table by table, giving conversation, hugs and posing for pictures with every single child. She’d gotten through about a quarter of the room and the next Princess was announced and followed the same protocol. 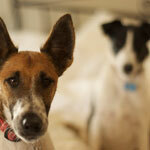 All told, we had five Princesses, all of the Old Skool Disney variety. 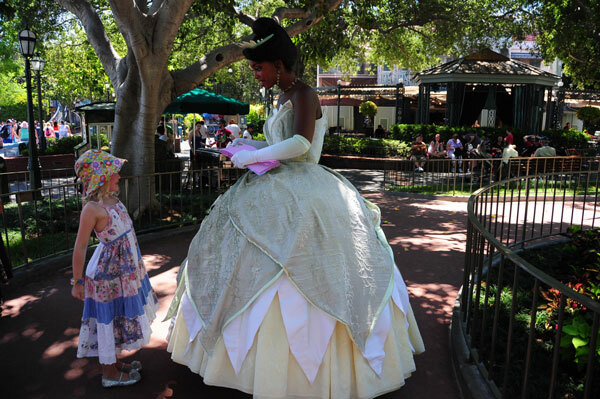 And each and every kid met each and every Princess for a significant amount of Princess face-time. 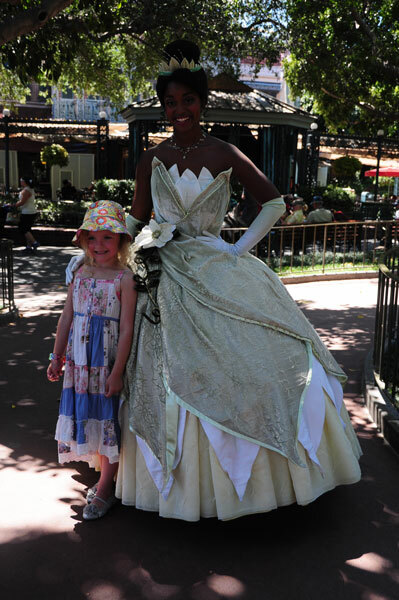 Luckily, we met Cinderella first, since that was the costume Amelia May had on. Not that we didn’t have three other costumes in our handbags, but by the time Princesses were coming out thick and fast, the excitement was too high for wardrobe adjustments. These Princesses compared dresses and glass slippers and found each other’s outfits excellent. 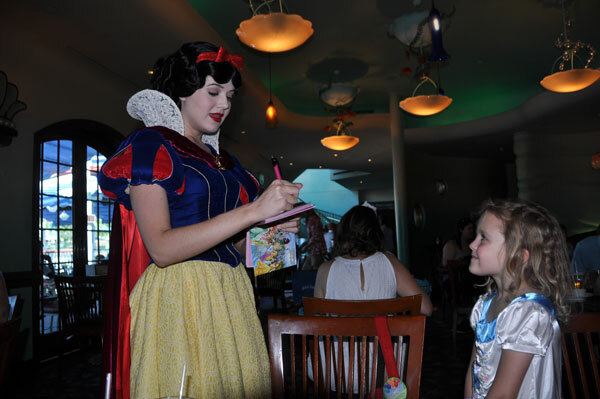 Did I mention that the Princesses will sign your autograph book? And if you don’t know about the autograph books, you’d better start reading up! Belle from Beauty and the Beast gave the best hugs. 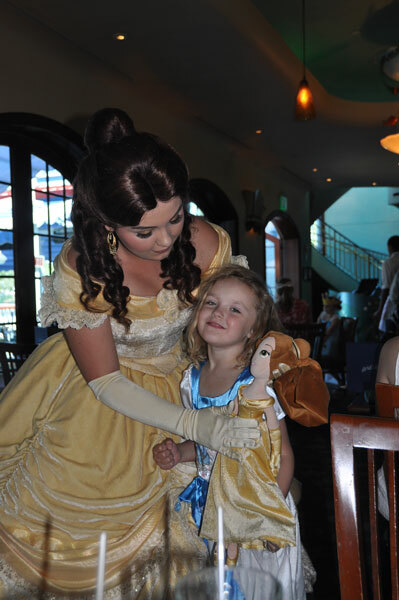 But that may be because we had a Belle doll to show her. I was thinking this was Rapunzel, except that her hair is too short. I’ve been informed that this is Aurora or Sleeping Beauty. By this time, we were wrung out, so Ariel’s Grotto wisely served us an array of desserts with a lot of sugar to pep us up. 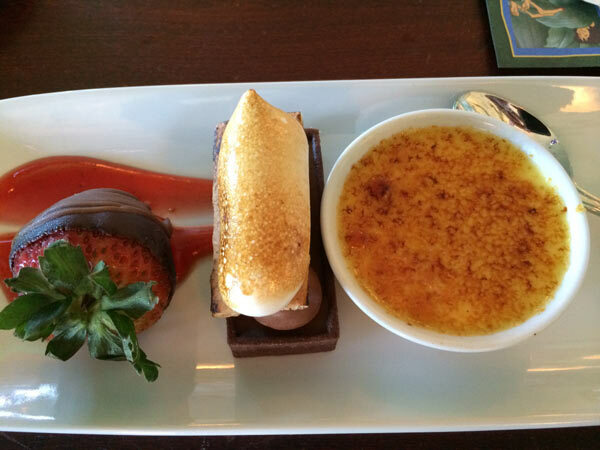 Creme brulee, chocolate truffle and chocolate dipped strawberry. 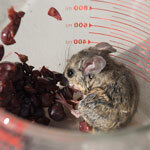 By the way, this is the adult dessert. The kids get Jello. Here’s the thing about Ariel’s Grotto: it’s actually a very nice restaurant. We had a seafood salad featuring fresh greens, quail eggs and lobster tail. The kids get mac & cheese, but they won’t eat it anyway. It’s an expensive lunch, but not much more expensive than any of the sit-down restaurants at Disneyland or Downtown Disney. But the real thing to consider is: you can get your Princesses for free, but you’ll have to track them down in the park and wait in line in the hot sun. On this day, the temperatures were 104 degrees and the line to meet Elsa and Anna from “Frozen” was FOUR HOURS LONG! Contrast that with getting five Princesses delivered to you in the convenience of your seat in an air conditioned restaurant while you eat a delicious meal. 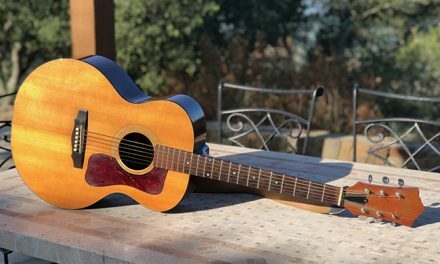 Don’t tell Uncle Walt, but I would have paid twice the price and called it a bargain. Now, be forewarned: the Princesses you get at Ariel’s Grotto are going to be mostly the Old Skool Disney Princesses, except for Ariel. 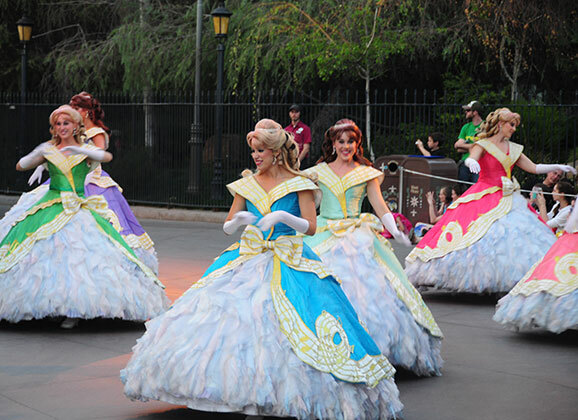 If you want the newest hottest Princesses, you’ll have to seek them out and line up for them. By this time, we felt we had our Princess quota, although some of us forgot to mention to a certain someone that the Frozen Princesses were even an option. Because A FOUR HOUR LINE IN 104 DEGREE HEAT!!! However, you can get lucky. On our last day, we were riding the rails of the Disneyland Railroad for the third time in a row when we spotted our absolutely favorite Princess over in New Orleans Square. 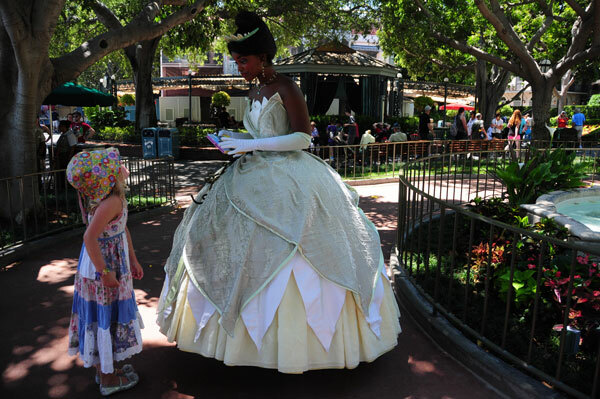 Maybe it was the heat, maybe it’s because New Orleans Square isn’t that popular a Disneyland destination, or maybe the Princess Cognoscenti haven’t yet caught on to the awesomeness that is Princess Tiana, but the line was a mere few minutes. Which was wonderful, because we had so much to tell Tiana. And she listened very carefully and gave wonderful advice. We, of course, told her that she was our favorite Princess. And that we were going to have a “resh-rant” just like her one day. She said we could make that dream come true if we worked hard. We said we were a little worried the villainous voodoo guy, The Shadow Man, might come around. But Tiana said we didn’t have to worry about him. 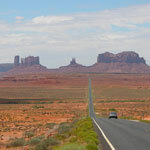 Still, we reminded her that you should never shake hands with The Shadow Man. And we told her again that Princesses RULE. Especially her! Because she doesn’t wait around for some prince to save her. She rescues him AND gets her restaurant on her own. And helps defeat The Shadow Man. I think we’d have to say, we got more than our money’s worth in Princesses on this trip! How lucky is Amelia to have godparents like you. I had a great time last year when we took our granddaughters to Disney World in Orlando. I know I am late to the party reading this but I have been caught up in the live snarking of the UnVictorianing of the ‘Helen Mirren’ over on Facebook but holyheavenswoman! I actually have tears in my eyes reading this bc you and Mama Suzi are the bomb and A is living the good life.